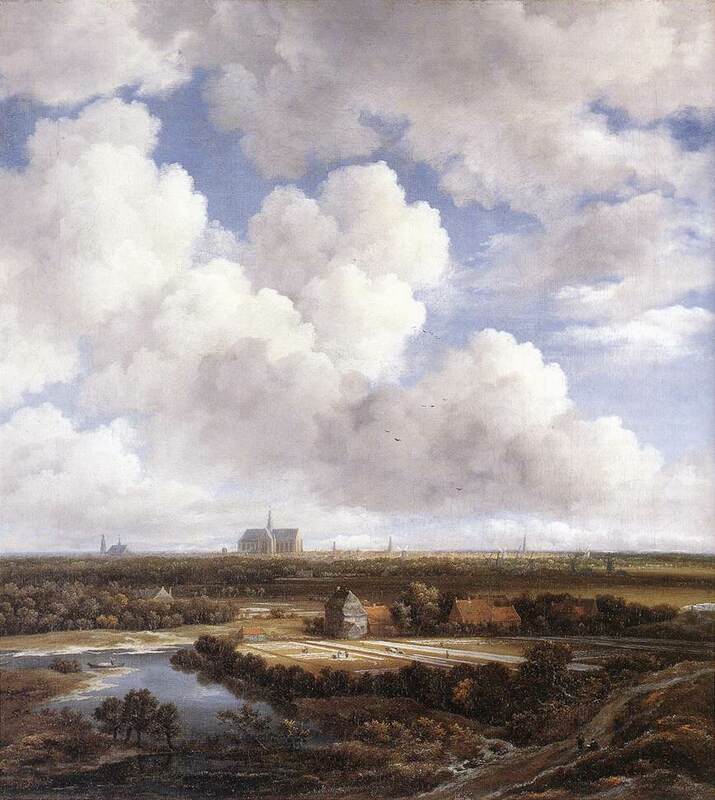 Jacob van Ruisdael’s View of Haarlem from the Dunes at Overveen (late 1660s) is filled with signs of protection and prosperity that the Dutch credited to God’s providence. Ruisdael (c. 1628–1682) is one the greatest Netherlandish landscape painters of the seventeenth century. Ruisdael was a painter of nature. By contrast, his predecessors, including his uncle and teacher Salomon van Ruysdael, painted scenes of human activity happening outdoors. In their work, the landscape elements remained contextual to the human subject. In Ruisdael’s art, the nature becomes the subject. Motifs such as trees, waterfalls, hills and clouds, as well as architectural ruins and windmills, are the protagonists. The presence of human figures is distinctly minimized, leaving the processes of creation as the paintings’ subjects. While figures appear in his paintings, they read in relationship to the landscape. Ruisdael painted View of Haarlem at the height of his talent and success. The work’s title is somewhat misleading since Haarlem, where Ruisdael was born, is just discernable in the distance. This spacious painting’s most prominent motifs are clouds, fields, and the sunlight that connects them. Irregular patterns of light and shadow play over the geometric organization of the linen-bleaching fields. Much of this land had been reclaimed from the sea, as the viewer stands on the dunes that hold that water back. On the horizon stands the church of St. Bavo, where Ruisdael would be buried. Its spire connects earth and heaven. Ruisdael constructs a composition of areas of light and shadow, which leads the viewer first across the fields and then through the clouds. The compositional structure of View of Haarlem by which Ruisdael brought together elements, observed and invented, in one unified vision may be called coherence. This method, like the vision of Haarlem that it describes, emphasizes order and interconnectedness. In looking at View of Haarlem one is struck by its rich visual detail. The cumulous clouds are depicted with meteorological accuracy. The famous linen-bleaching fields are laid out with precision. The viewer has a sense of arriving at a fortuitous moment when the weather is changing from overcast to sunshine. Art historian John Walford has called Ruisdael’s method ‘selective naturalism’ in his book Jacob van Ruisdael and the Perception of Landscape. Walford notes that Ruisdael’s perception of nature was consistent with widely held seventeenth-century Dutch conceptions shaped by Reformed Calvinism of creation as ‘God’s second book of revelation.’ In this paradigm God is seen as the original, perfect and providential artist, whose work is copied by human artists. One of things that stands out in View of Haarlem is how much open space is represented. What this work makes manifest is that this space is full. Visually this space is full of light. This light suggests the omnipresence of God’s grace and providential blessing on Haarlem, which had adopted Calvinism around 1580. View of Haarlem demonstrates a belief in the universal authority of God over all of creation and culture. It is noteworthy that Ruisdael does not spotlight the church with a beam of light, as specially blessed. The majority of the painting features daily commercial activities, all of them being equally blessed by God. The land reclaimed from the sea, cultivated fields, and bleached linens all call attention to humanity’s divinely-given charge to cultivate and fill the earth. Yet all of these actions and events take place within the delicate balance of forces, from sunlight to flooding, that are beyond human control. The work speaks to our ultimate dependence on the providence of God. The clouds that fill the sky and overtake the viewer suggest that, although we may be situated above the landscape, there is a realm still higher than our own. This recalls promises kept and promises of even greater things to come. Ruisdael’s View of Haarlem may be read as a visual description of God’s provident direction revealed both in nature and human activity, a distinctly Reformed theme and one that would have resonated with seventeenth-century Dutch viewers, who believed that their recent political, economic, and religious freedom was divinely ordained. This meditation is an exerpt from the introductory essay ‘You Will See Greater Things Than These: John Walford’s Content-oriented Method of Art History’ published in Art as Spiritual Perception: Essays in Honor of E. John Walford (Crossway 2012), edited by James Romaine. For more details about the book, click here. Jacob van Ruisdael: View of Haarlem from the Dunes at Overveen, ca. 1670, 55,2 x 62,5 cm, oil on canvas, Kunsthaus Zürich, Switzerland. Jacob van Ruisdael was born c. 1628 in Haarlem. His father was an artist and his uncle Salomon van Ruysdael was a prominent landscape painter. Ruisdael moved to Amsterdam and became the most important landscape painter of the Dutch Golden Age. His works combined naturalism and monumentality. Ruisdael died in Amsterdam in 1682.